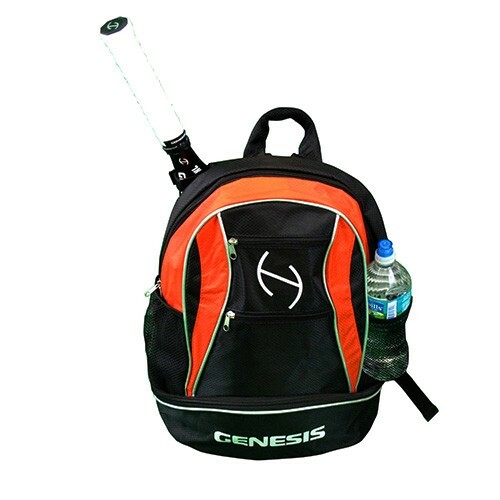 Genesis Tour Back Pack Bag- Great for Tournaments & Back To School! Genesis introduced a back pack that is made not only with the tennis player in mind, but also great for school. The Genesis Tour Back Pack Bag is a phenomenal tennis backpack and tennis bag to use on and off the court! For your convenience, there are 2 main compartments along with 4 additional zippered pockets. The racquet compartment can fit note books. The large main compartment is big enough to fit most of your books. There is also a divider in this pocket which can fit not only books, but even a full size laptop. A small zippered pocket in the main compartment is also available to store your personal belongings. In the front of the bag, there is one zippered pockets for your accessories. Towards the bottom of the bag is a shoe pocket with ventilation holes that can be used FOR…. There are also 2 side mesh pockets which can fit a water bottle. The quick grab handle on the top of the bag allows for easy handling. The backpack straps are well padded and adjustable for comfortable carrying. The rear of the bag is padded for increased comfort. This entry was posted on August 11, 2014 at 12:43 pm and is filed under Uncategorized. You can follow any responses to this entry through the RSS 2.0 feed. You can leave a response, or trackback from your own site.